^ Ioanna Venieri. Acropolis of Athens. [2007-05-04]. ^ Kenneth D. S. Lapatin, Chryselephantine Statuary in the Ancient Mediterranean World, 2002, p.63. ^ N. Leipen, Athena Parthenos: a reconstruction, 1972. ^ Hurwit, The Athenian Acropolis, 161–163. * Parthenos. Encyclopaedia Mythica. [2007-10-18]. （原始内容存档于2008-05-17）. ^ "The Surface Conservation Project"[永久失效連結] (pdf file). Once they had been conserved the West Frieze blocks were moved to the museum, and copies cast in artificial stone were reinstalled in their places. Bernal, Martin. Black Athena Writes Back-CL: Martin Bernal Responds to His Critics. Duke University Press. 2001. ISBN 0-822-32717-1. Burkert, Walter. Greek Religion. Harvard University Press. 1985. ISBN 0-674-36281-0. Connelly, Joan B. Parthenon and Parthenoi: A Mythological Interpretation of the Parthenon Frieze. American Journal of Archaeology. January 1996, 100 (1) [2007-04-23]. Frazer, Sir James George. The King of the Woods. The Golden Bough: A Study in Magic and Religion. Oxford University Press. 1998. ISBN 0-192-83541-6. Hurwit, Jeffrey M. The Athenian Acropolis: History, Mythology, and Archeology from the Neolithic Era to the Present. Cambridge University Press. 2000. ISBN 0-521-42834-3. Hurwit, Jeffrey M. The Parthenon and the Tample of Zeus at Olympia. (编) Judith M. Barringer, Jeffrey M. Hurwit, Jerome Jordan Pollitt. Periklean Athens and Its Legacy: Problems and Perspectives. University of Texas Press. 2005. ISBN 0-292-70622-7. Neils, Jenifer. 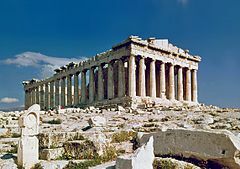 The Parthenon: From Antiquity to the Present. Cambridge University Press. 2005. ISBN 0-521-82093-6. Pelling, Christopher. Tragedy and Religion: Constructs and Readings. Greek Tragedy and the Historian. Oxford University Press. 1997. ISBN 0-198-14987-5. Whitley, James. The Archaeology of Democracy: Classical Athens. The Archaeology of Ancient Greece. Cambridge University Press. 2001. ISBN 0-521-62733-8. Greek Premier Says New Acropolis Museum to Boost Bid for Parthenon Sculptures. International Herald Tribune. 2006-10-09 [2007-04-23]. Parthenon. Online Etymology Dictionary. [2007-05-05]. Talks Due on Elgin Marbles Return. BBC News. 2007-04-21 [2007-04-23]. Ioanna Venieri. 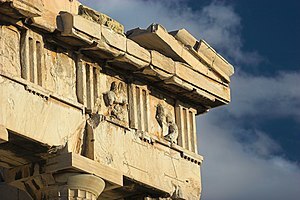 Acropolis of Athens - History. Acropolis of Athens. Οδυσσεύς. [2007-05-04]. Beard, Mary. The Parthenon. Harvard University: 2003. ISBN 978-0-674-01085-7. Cosmopoulos, Michael (editor). The Parthenon and its Sculptures. Cambridge University: 2004. ISBN 978-0-521-83673-9. Holtzman, Bernard. L'Acropole d'Athènes : Monuments, Cultes et Histoire du sanctuaire d'Athèna Polias. Paris: Picard. 2003. ISBN 2-7084-0687-6 （法语）. Queyrel, François. Le Parthénon, Un monument dans l'Histoire, Bartillat, Paris, 2008. ISBN 978-2-84100-435-5. Tournikio, Panayotis. Parthenon. Abrams: 1996. ISBN 978-0-8109-6314-6. Woodford, Susan. The Parthenon. Cambridge University: 1981. ISBN 978-0-521-22629-5.